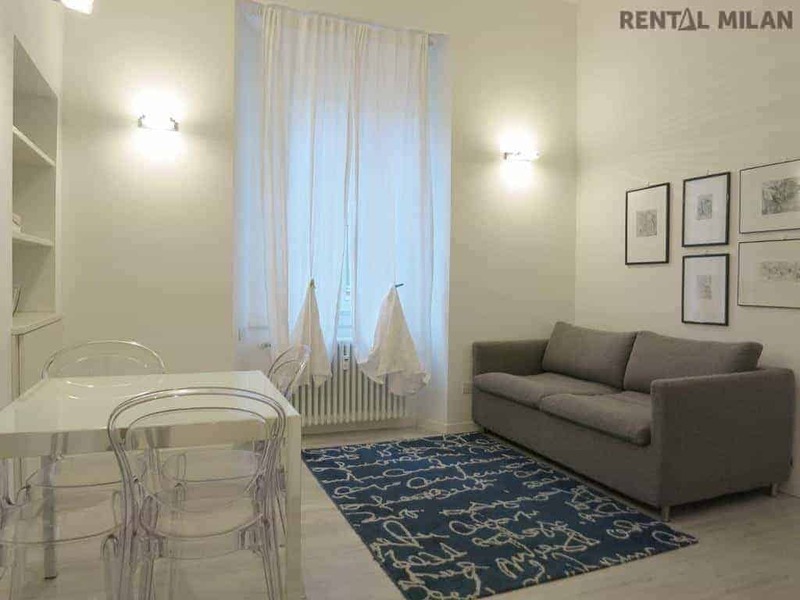 Beautiful one bedroom apartment Milan totally renovated with a very modern design. Entrance, bright living room with a sofa double bed, table and chairs, a library and TV. Separated modern fully equipped kitchen with a little inner balcony, very useful as storage room and to hang the clothes to dry. Bedroom with a double bed, a desk and a wardrobe. Bathroom with a modern large shower, washing machine and a window. Air conditioning, hi speed wifi internet with optic fiber, satellite TV. The apartment is facing the inner quiet elegant courtyard and it’s on the 2nd floor with elevator of a beautiful ancient building in perfect conditions, with doorman service. It’s located in the heart of Brera district, the most central and prestigious area in Milan. Quiet, upscale and very safe residential area. Brera district: artists’ neighborhood and a place of bohemian atmosphere, sometimes referred to as “the milanese Montmartre”. Sophisticated and romantic restaurants and bars (Brera is one of the most popular Milanese neighbourhoods for what concerns night life), antique and art shops, colorful street markets, as well as fortune tellers’ booths. All the main public transports, shops and services nearby.